Planting up my planted tropical aquarium. eRodent > Tropical Aquarium > Planting the Aquarium. Planting up my Planted Aquarium. On this page I'm going to talk about the process of adding plants to my new tropical fish tank. I've described the process of setting up my tank, a Juwel Rio 240 on the Setting up a Planted Aquarium page and at the start of this page I have a tank with substrate (Aquagrit topped with gravel with Laterite and tetra complete) some stones, a slightly tacky fake cave and a well soaked lump of bog wood. I've filled it with water treated with API StressCoat (to remove chlorine and chloramines) and StressCoat which is supposed to contain live filter bacteria but there is a lot of cynicism about these products. I'm a complete novice to the hobby but have a good grounding in gardening, a microbiology degree and a determination to turn it into an ecosystem not a chemistry experiment. I'm afraid I've given up on keeping track of costs, although the majority of them have been covered in the previous page. With water and the glass cleaned up. 2x Echinodorus cordifolius ssp. fluitans - a nice, large leaved, plant to go at the back and add structure. Echinodorus 'Ozelot' (Green)- a posh, quite expensive version of the above to go in front, right hand corner to hide the filter box. 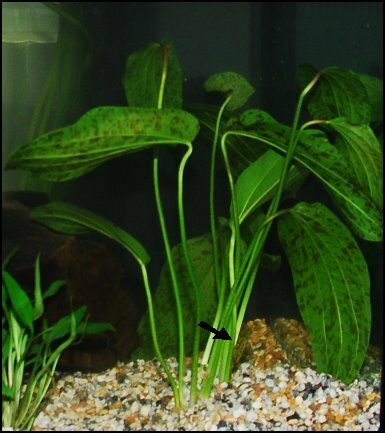 3x Vallisneria spiralis `Tiger` - long thin leaves that I think look more natural than some of the larger leaved plants. Limnobium laevigatum - Amazon Frogbit a small surface floater. Anubia barteri var. angustifolia - a really nice foreground plant but a bit expensive hence just the one. 3 x Cryptocoryne x willisii - another nice foreground plant. 3 x Glossostigma elatinoides - a tiny leaved foreground plant that, hopefully, will form a carpet with care. This is the site for the : Tropica Catalogue which lists all of their plants. You can tell why people who just stick fish into their tank without maturing the filter get problems. The water is smelling very slightly stagnant at the moment meaning that something is going on - there's also some interesting colonies of something on the glass. Lights are off at the moment to stop algae taking hold. I did some water tests yesterday and got Ammonia 0, Nitrites 0 (as would be expected), Nitrates 0 (which is good as it means none in the water). I've got two pH tests - the wide range simply tells me it's between 7.0 and 8.5 (useless) and unfortunately the narrow range is a low one and I really simply know it's at least 7.6, although I'm pretty sure that this is the pH. I got confused as this point because I noticed looking at the permanent pH indicator in the tank that the pH it showed was dropping showing 6.8 whilst the pH of the water was still 7.6. I had no idea what was going and did serious reading. OMG this is impossibly complicated. What I have with the JBL permanent CO2 test is what is commonly known as drop checker. This is used for measuring the dissolved CO2 in the water using the pH of a small amount of water of known harness separated from the tank water by an air bubble. Basically CO2 from the tank water diffuses into the air bubble and then on into the water in the drop checker. When CO2 dissolves in water it creates weak carbonic acid and lowers the pH of the water in the drop checker. The lower the pH of the water in the drop checker, the more CO2 there is in dissolved in the tank water. Too much CO2 is bad for fish, too little is bad for plants. However this also depends upon the Carbonate Hardness (KH) of the water in the drop checker as carbonate buffers any acid. Ideally you fill the drop checker with water of a known KH (4 dKH) to read accurately, although my drop checker instructions just suggest using the tank water and provides a table to compare dKH with pH to get CO2 concentration however this can be affected by other things in the water - for example phosphate. I bought myself some dKH water online so that I could be sure the reading was accurate. sIf you want to know more there is more on drop checkers here and ph/GH/KH generally here. Having received my carbonate and general hardness water test I've found a more pressing problem. Although my tap water has a Carbonate Hardness (KH) of 4 and General Hardness (GH) of 9, the water in the tank has a KH of 5.6 and GH of 12.3.Something has raising the hardness of the tank water. Usually this is due to the rocks or substrate added. I did an experiment where I soaked some of each in tap water overnight and none of them seemed to be affecting the hardness of the water. I am hugely demoralised by the whole thing - if I could go back I wouldn't bother to buy the tank in the first place but with £100s worth of plants coming tomorrow I just need to try to sort it. Update: Turns out it was a problem with some of my gravel and I also have phosphate in my tap water - more on this below!. Honestly the post office is hopeless, they never deliver anything in a hurry. I know this, so this afternoon when I got home I went and asked them to look for my parcel as I didn't want it in a cold post office depot for any longer than necessary. Sure enough it was there. 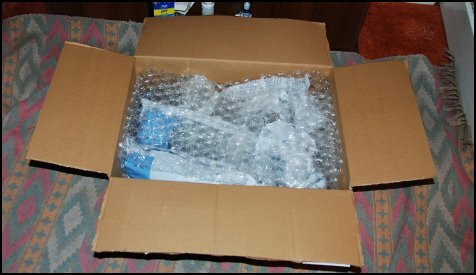 Anyhow here they are all nicely packed up in a cardboard box. The plants came in ones and twos in plastic bags with bubble wrap. Each of them are in a little pot surrounded by mineral wool. I followed the Tropica instructions and carefully separated the mineral wool from the roots, trimmed off the oldest leaves and shortened long or brown roots. The smallest plants I simply cut the bottom half from the rock wool. I had bought a pair of very sharp nail scissors for the job. I removed 50% of the water in the aquarium before planting the plants using my gravel cleaner which worked well although sadly the bucket clip doesn't completely seal off the pipe when closed. Then I carefully positioned all of the plants where wanted, digging a hole in the gravel with my hand and carefully refilling it when the plant was in place. 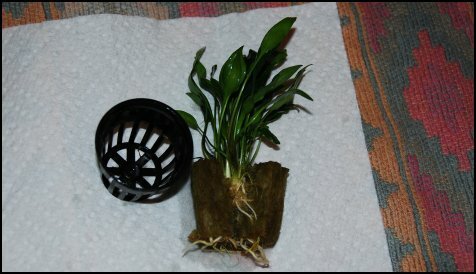 The Vallisneria (the plant with the tall thin leaves) was actually several small plants per pot so i divided them and planted them separately and I carefully broke the Glossostigma (the tiny leaved foreground plant) into smaller pieces and planted them separately. It is a bit easier said than done and I didn't quite get all of the roots buried. Amusingly I found a couple of small pieces of java fern in with the other plants so I have put them on my bog wood with a stone holding them down to see if they take. The photo below shows the tank after I have started to refill it. I treated the water in a bucket and then put it into the tank with a jug. I used cold water because it is too difficult to heat up the 120l of water, but the heater got it to temperature over night. I would have been much more careful with fish in the tank. Here is the final tank. The plants threw out loads of O2 initially, there were bubbles everywhere and the new leaves on one of the Echinodorus unrolled overnight so I'm hoping they are happy. The tank certainly looks a lot better. Now comes the bit that requires patience; waiting for the plants to mature a bit and put down good roots. Many people new to the hobby would be merrily lobbing ammonia into the tank at this point to fishless cycle the filter, but I'm going to take it a bit more easy and try to develop a little eco system not a chemistry experiment. I got a couple of hitchhikers with the plants, first a Malaysian Trumpet Snail happily munching the bog wood, who I have decided to keep as they aerate the substrate and eat decaying plant matter. There is also another snail that I cannot identify and may need to come out if I ever see him again! Snails can over-reproduce and can be a bit of a nuisance. 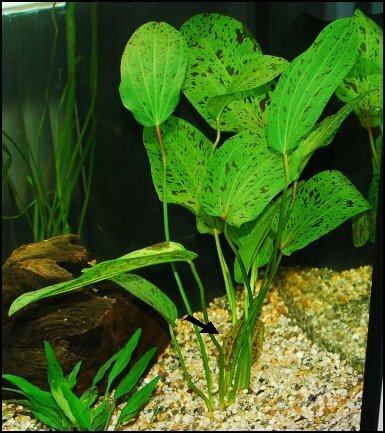 However they are also very good at eating waste plant material and I could put a small loach in to eat them if they become a problem. However that would stop me having shrimps - it's all just so complicated. Turns out I had about 4 different types of snail on the weed. 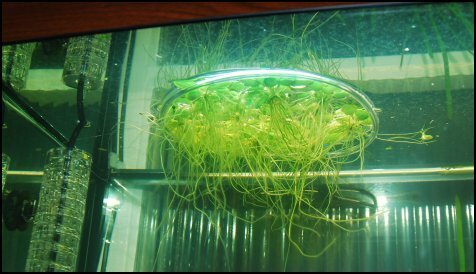 One problem that quickly became apparent was the fact that the Amazon Frogbit all floated to the filter inlet. I have rigged up a piece of filter pipe in a circle and tethered it to the CO2 diffuser to keep it in one place where it does not shade the other plants. I may make a slightly larger one as it's a little bit crowded. One tip - to straighten out coiled plastic tubing put it in hot water. Although it's obvious in this picture it doesn't show unless you sit below the tank and look up. Viewing the tank from most angles you can only see the Frogbit roots. They are really for the fish to hide in. The CO2 is merrily blooping away. It's currently on 30 bubbles a minute. I've set up the permanent pH test again and tested the KH (currently 4.6dH). Initially the pH was about 7 making the CO2 14ppm on the chart in the instruction book. This was a bit low, but it went down to 6.8 indicating a CO2 of about 20-25ppm. 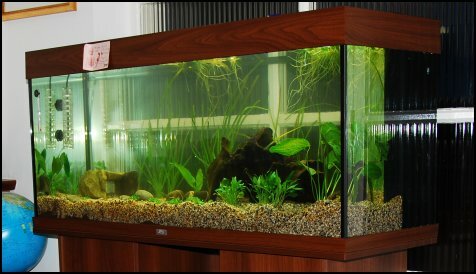 The planted tank people all say it should be 30ppm but the instructions say 15-30 with 20-25ppm as ideal. I'm sticking with the instructions for now. I'm wondering if I have the diffuser somewhere with enough water flow as it is the other side from the filter but let's give it a chance. Honest though you can virtually see the plants growing if you watch for long enough. There were two rolled up leaves on the Echinodorus Ozelot on Friday when I got them. Both have unrolled and increased in size and now there's another new one coming. All of the leaves have also moved up towards the light. I suspect that this may be a problem later on, but at the moment I'm looking forwards to the planting getting denser. They're coming to get you! One day's growth. Unfortunately I was wrong about the substrate. One lot of the gravel I was sold contained limestone chips. I would seriously advise you to test any substrate you buy by dropping a small amount in vinegar. Vinegar is acetic acid and this reacts with the calcium carbonate in the limestone releasing carbon dioxide causing it to fizz slowly. And guess what - a couple of the pebbles but more importantly some of my gravel fizzes. So the reason the carbonate hardness in the tank water was higher than the tap water was this limestone. Boy was I annoyed about this. I did consider not changing the gravel as hard water doesn't hurt the plants and it is possible to get fish that can tolerate it, but decided that it would annoy me for the whole life of the tank. So the great gravel change out was done. 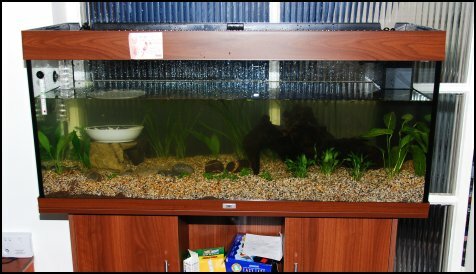 I removed all 230l of water, the vast majority of the gravel and aquagrit layer as it was quite mixed, only conserving the tetra complete and laterite. Then I replaced the aquagrit and put some lime free gravel over the top. Sadly the sand had to go - it was proving too difficult to keep it separate from the gravel. We put back in about 1/3 of the water and heated it with bowls of water heated up in the microwave. I don't trust using the kettle because of the fur and, although some people do use their tap hot water mine comes through old pipes from a hot water tank and I'm concerned about contamination. Apparently it's ok to do if you have modern pipes and a combi heater. The plants were all taken out carefully whilst emptying the water with a stainless steel kitchen fork and stored in buckets of warm tank water. Once we'd got the water to 15 degrees I replanted them after carefully trimming off any tatty bits and wiped off any algae. This was a very difficult job as the water was cloudy. I took the opportunity to do a small amount of rearranging and planted some further from the glass. Sadly the gravel ended up a bit deep at the front and it seemed to come forwards as I planted and I think I managed to add too much again. I put back in about 40-50l of the original tank water. This time I put a nice piece of slate and a couple of pebbles that didn't fizz in vinegar in. It all looked a little bit tatty in places but the plants all started producing lots of oxygen bubbles straight away. The best explanation for this that I could find is that tap water is saturated with oxygen so that when you first fill the aquarium the O2 produced by the plants bubbles off rather than dissolving. Sadly I seem to have lost my Malaysian trumpet snail in the change-around but kept the other 3 species - ho-hum. So here is the tank two days after changing the gravel. It's doing amazingly well considering. I've been feeding once a week with the JBL Ferropol that came with the CO2 checker. I've got the CO2 running at about 60bpm at the moment which means the drop checker is showing somewhere between pH 6.4 and 6.8 - I'm going to change the solution to something more accurate at some point but too much CO2 isn't a problem with no fish. You can see the rate of growth of the Hygrophilia in the back left hand corner and the Echinodorus at the front on the right in less than a fortnight even with the big change over. The tank after just under two weeks including a gravel change. The other thing I have discovered this week is that my tap water is high in phosphate. This won't necessarily be a big problem for the fish and the plants will happily use it, but it will make it difficult to get accurate readings on water hardness tests as it also acts as a buffer. I need to do a bit more reading on this one. I will move onto maturing the filter on the Cycling the Aquarium page. 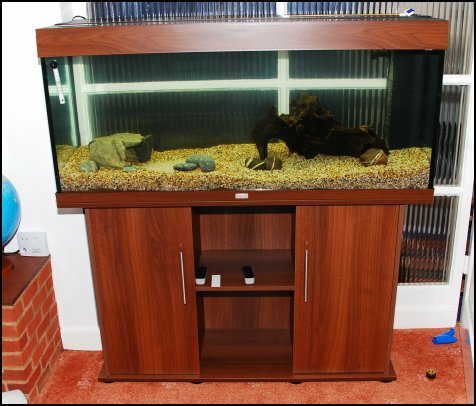 Here is the aquarium after a couple of months just after putting the fish in. It did quite well on Rate My Fish Tank which I'm very pleased with for a first effort. In the end the Glossostigma didn't do all that well. It tended to grow tall and leggy due to lack of light and also got a real staghorn algae problem which my little Siamese Algae Eater couldn't manage alone. I ended up taking it out and he cleaned up the other plants quite well. I still have some brown algae here and there but it's much better. Maintenance of the tank is an ongoing thing. Just because a plant looks wonderful one week it doesn't meant that it will continue to do so and so some plants have gone and one or two more put in. As previously mentioned I have had some problems with the Ozelot and am trying some new root tabs to see if it will pick up again. This is its last chance - it will need to go if I can't save it. So here is the tank nearly a year after I set it up. Do you like this page? Is it useful? Please email me and let me know. Put something about aquariums in the title so I can pick it out if my spam filter gets it.